Outer Banks Service Directory – Connecting OBX homeowners with trusted service providers. let an Outer Banks service professional handle the rest! Select a category below to find an Outer Banks service provider for your home. Use the Outer Banks Service Directory to find trusted Outer Banks service professionals. Find who offers the services you need in the service area of your Outer Banks home. View, contact, and have an Outer Banks service professional handle the rest! Search by service, category, or provider to view a list of Outer Banks service professionals who offer the services you need. Contact Outer Banks service providers who offer the services in the service area of your Outer Banks home. Hire an Outer Banks Service Provider to complete the work you need at your Outer Banks home. Homeowners across the United States depend on the Outer Banks Service Directory to find service providers who service the area of their Outer Banks home. 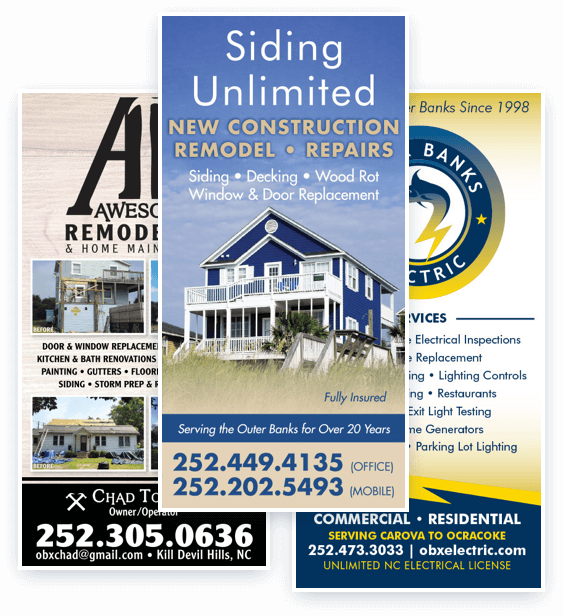 Advertise with us to reach Outer Banks homeowners looking for service providers from Corolla to Hatteras including Roanoke Island. I look forward to receiving the Outer Banks Service Directory every year. We have found the companies listed in the directory to be not only professional and dependable but also local small businesses with a vast knowledge of the Outer Banks. The OBX Service Directory makes managing my Outer Banks property easy by compiling all the home services in one convenient place. With a single affordable ad in the Outer Banks Service Directory, you can reach Outer Banks homeowners across the United States. Put your business in the hands of over 20,000 homeowners seeking home services today.